The Siberian area of Russia is experiencing a huge wave of wildfires in their taiga forests. Hot, dry weather complicates the outlook for getting these fires under control. Estimates of the amount of land burning at present have been as high as ten million hectares since the beginning of 2018 which is 38,610 square miles. 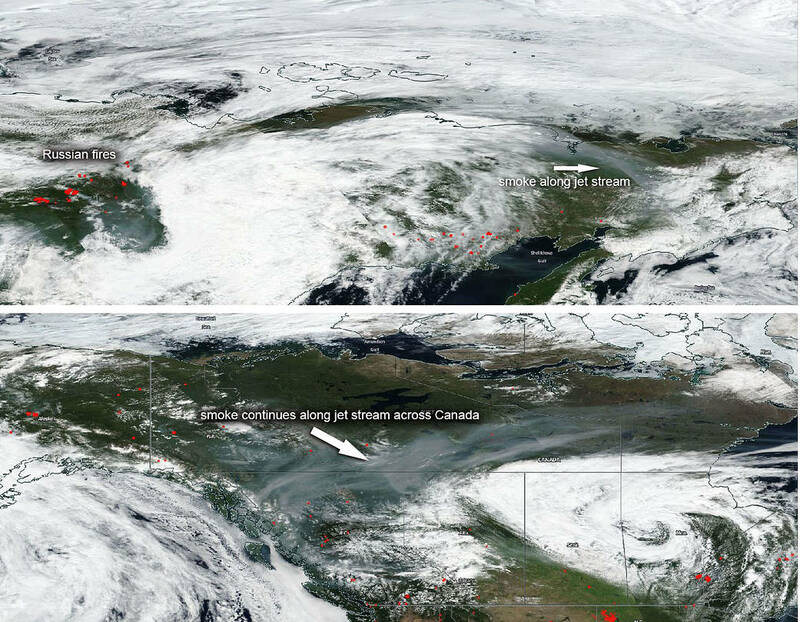 Fires are dangerous, of course, and do significant damage to the area where they are burning, however, smoke is dangerous as well and can spread so much more quickly than fire as evidenced by this satellite image showing the smoke from the Siberian fires reaching Canada. The smoke released by any type of fire (forest, brush, crop, structure, tires, waste or wood burning) is a mixture of particles and chemicals produced by incomplete burning of carbon-containing materials. All smoke contains carbon monoxide, carbon dioxide and particulate matter or soot and is hazardous to breathe. Recently though, a study was published in Nature Geoscience in May 2017 which discovered that particle pollution from wildfires, long known for containing soot and other fine particles known to be dangerous to human health, is much worse than previously thought. Naturally burning timber and brush from wildfires release dangerous particles into the air at a rate three times as high as levels known by the EPA, researchers at Georgia Tech found. The study also found wildfires spew methanol, benzene, ozone and other noxious chemicals. Residents that smell smoke or see haze in the air should take precautions against breathing too much of it and stay tuned to local air quality information. Taiga burning’ - as scared bears are driven out of their natural habitat towards settlements where they are shot as danger to people.